The Rockstar Royal Group team is heading into this penultimate 2010 round knowing that the reliability of their Buffum-prepared Mitsubishi Evo X is key. « They’re calling for good weather but honestly, I wouldn’t mind more challenging conditions because our new Yokohama A053 tires are competitive in all types of road conditions. » The 2010 Pacific Forest Rally is similar to previous years, with the addition of two new roads. « We’ll refine our notes during the reconnaissance of the roads that we already know and as for the new roads, Antoine’s very good at making precise notes in two passes and he’s generally fairly confident on stages that we’ve never seen before. One thing is for sure, this will be a good battle for the win ! » explains Nathalie. In addition to the North American title clinched at Rallye Défi three weeks ago, his third including 2007 and 2008, Antoine L’Estage has two Canadian championship titles (2006 and 2007), one American and twenty-three overall victories in Canada and the United States. Nathalie Richard holds five overall national championships (Canada and USA) and twenty-nine national victories on both sides of the border. The North American title she won at Rallye Défi is her sixth in seven years. Antoine L’Estage and Nathalie Richard is the only team to participate in the entire 2010 Rally America and Canadian Rally Championships, with the support of Rockstar Energy Drink, Royal Group, Yokohama Tires, Mitsubishi Canada, Drenth Motorsport Gearboxes, Garrett Turbos, Énergie Cardio, Libra Racing, Driver's Edge Autosport (OMP), and VP Racing Fuels. For more information on the team or on rallying in general, visit Coyote Rallye . Antoine L’Estage and Nathalie Richard, both of St-Jean-sur-Richelieu (QC) are among the favourites in this weekend’s Pacific Forest Rally, in British Columbia, the penultimate round of the 2010 Canadian Rally Championship. 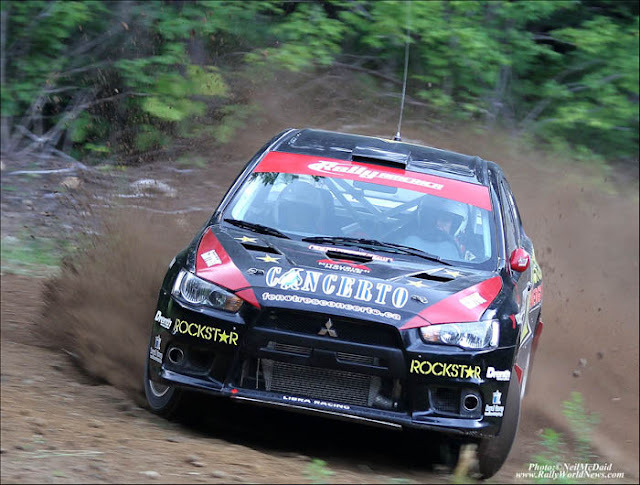 At the wheel of their Rockstar Royal Group Mitsubishi Evo X, the team has won four of the past five events in North America and is striving for a sixth win this weekend, which would vault them into the lead of the Canadian title hunt.